Today’s post is contributed by Florian Renk and the Mission Analysis team at ESA’s ESOC operations centre, Darmstadt. Florian did a lot of the planning work to analyse the ‘hows’ and ‘whens’ of LISA Pathfinder’s trip to space. On 3 December, a new mission joined ESA’s fleet of spacecraft around Earth. Well, in this case, it’s not exactly around Earth. Or is it? LISA Pathfinder is travelling to an orbit around the so-called L1 Lagrange point, also called the Sun-Earth Libration Point 1. SEL1 is located about 1.5 million km toward the Sun from us, when looking at the Sun from the Earth. It lies in the ecliptic plane, the plane in which the Earth moves around the Sun, so like the Earth, the libration point also moves around the Sun, making a complete orbit in one year. While it’s just a point in space, it exists because the gravitational pull of the Sun and the Earth provide just the right centripetal force in this spot to rotate with them. The surface indicates the effective potential created by the two massive bodies and the rotation of the secondary body around the primary. The libration points are located at the saddle points. 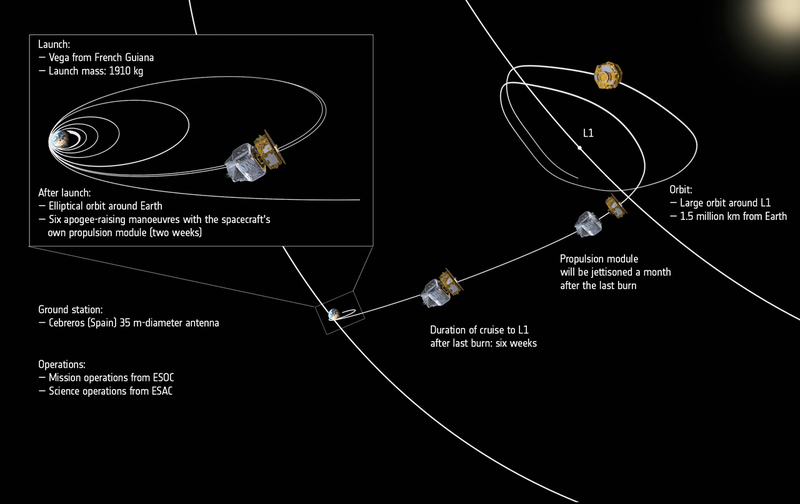 Compared to previous ESA spacecraft travelling to one of the Sun-Earth libration points (there are five), the journey of LISA Pathfinder is a bit more complicated. 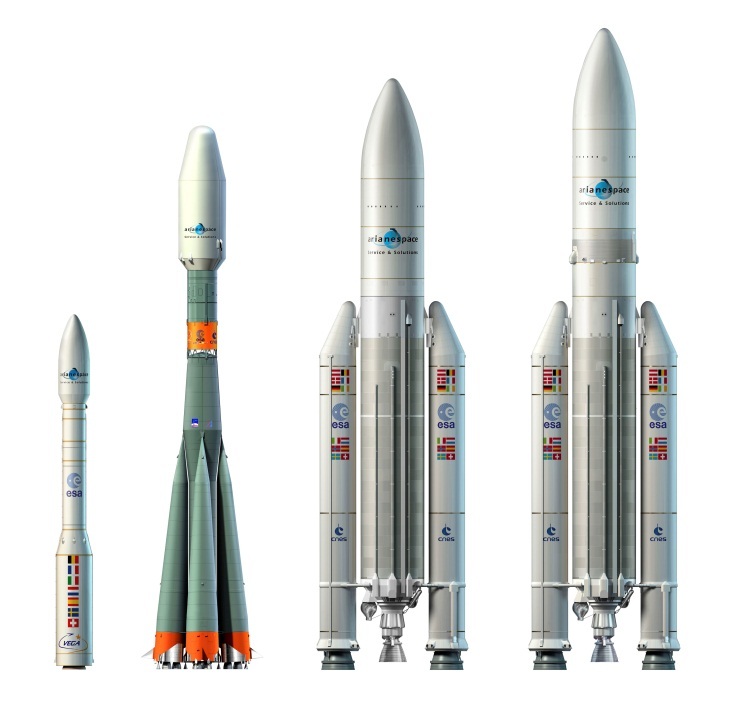 Herschel and Planck were launched on the powerful Ariane 5 rocket and Gaia got a smooth ride on the Soyuz-Fregat launcher. LISA Pathfinder, however, has started its journey to SEL1 on Europe’s smallest launcher, the Vega. Vega is not powerful enough to directly propel LISA Pathfinder towards its destination at 1.5 million km from Earth. It can only provide the initial ride into space and delivered the spacecraft into a slightly elliptic Earth orbit with a perigee (the closest point to Earth) of about 200 km and the apogee (the furthest point from Earth) of about 1540 km. 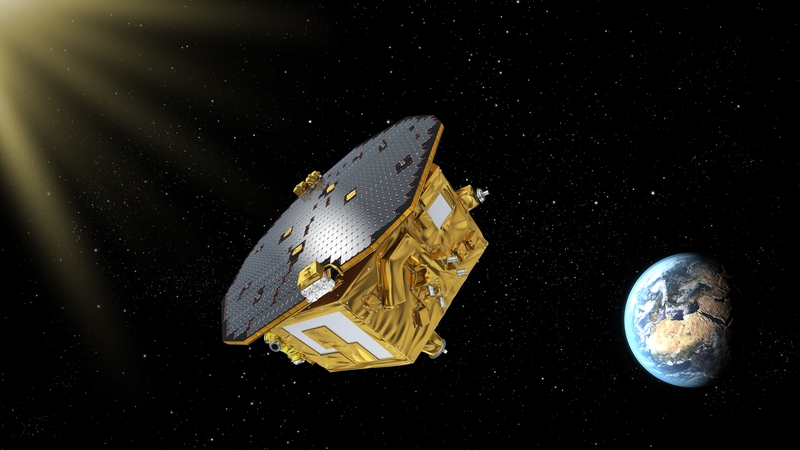 From this initial orbit, LISA Pathfinder must now use its own propulsion module to travel to SEL1. And this journey is a tricky one! To travel to SEL1, LISA Pathfinder must raise its apogee to be near the 1.5-million-km point and to do so the spacecraft will perform a sequence of ‘apogee raising manoeuvres’ (ARMs) providing a velocity increment of more than 3000 m/sec (in comparison, when Rosetta came out of deep-space hibernation in January of 2014 to start slowing down to catch comet 67P/C-G, it only had to slow its speed by 800 m/sec.). Further, the apogee cannot be raised in just one ‘big burn’, since LISA Pathfinder would need an extremely large main engine to perform this manoeuvre. Instead the craft’s propulsion module is equipped with a 450-Newton main engine (which is still pretty big! Rosetta has 24 10N thrusters) and will conduct a series of six burns between 7 and 12 December. Note: Additional thruster burns are planned to trim and correct the final trajectory; the six until mid-December are the biggies. Sometimes, spaceflight engineers say ‘manoeuvre’ when they mean ‘thruster burn’ or just ‘burn’ – these terms are all more or less equivalent wording. To actually fire the main engine installed on LISA Pathfinder (actually, installed on a Propulsion Module attached to LPF, which will be jettisoned at the end of January), the mission control teams must adhere to some strict constraints. One is the maximum burn duration the spacecraft can conduct; the burns usually take place in Earth eclipse (i.e. when the craft is in the darkness of Earth’s shadow) and thus we have to be careful with the available battery power. A single burn cannot run too long before the spacecraft must again be pointed toward the Sun to recharge its batteries. After each burn, we need some time to prepare for the next one. We need to schedule passes of the spacecraft over our tracking stations (see Note 1 below), which provide our flight dynamics team the radiometric data they need to determine how well the previous burn performed and to precisely determine the current orbit. They will then prepare the commands for the next apogee-raising burn and, after the commands have been generated, additional passes over the ground stations are required to allow the flight control team to upload the commands. This process repeats until we have executed the final apogee-raising manoeuvre. Moreover, all the specialists at ESOC (see Note 2 below) have to work fast to perform the apogee-raising sequence of burns with LISA Pathfinder because the spacecraft is passing dangerous terrain on its way out to SEL1: The Van-Allen Radiation belts. These are the reason why the manoeuvres to get to SEL1 are being executed as quickly after each other as possible: We want to limit the time the spacecraft spends in the radiation belts (so as to limit any deleterious effect on the craft’s delicate electronics). It is also the reason why the manoeuvres to propel LPF toward SEL1 are not only optimised for fuel usage and burn duration, but also to limit the time spent in the zones where we expect the highest radiation to occur. 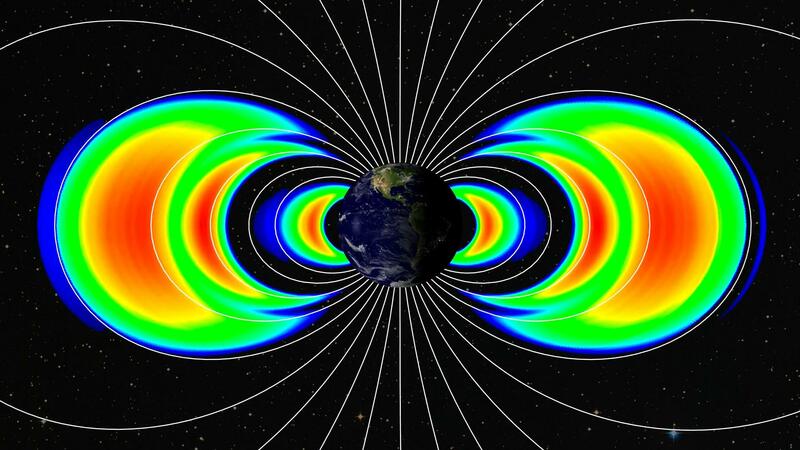 For example, the fourth manoeuvre is particularly large, ‘jumping’ over one of the worst zones of the radiation belts. So, it fell to ESA’s Mission Analysis team to determine the time at which Vega optimally roared into space such that after nine days the line of apses will be oriented such that we can go to SEL1 and that we don’t fly in the opposite direction (for that we’d launch about 12 hours later). Actually, the lift-off time was calculated such that even in case of delay or other contingencies during the immediate post-launch days (LEOP – the critical Launch and Early Orbit Phase) a correct orbit about SEL1 can still be reached. In addition, the launch time and trajectory were carefully planned so that LISA Pathfinder stays well clear of the orbit of the International Space Station. Note that we didn’t have to exactly point toward the Sun to go into an orbit about SEL1, despite this point being located on the direct line between Earth and Sun. There is a certain range where this line-of-apses can point. Nonetheless, there are many other considerations that require us to pick only one specific lift-off time. For example, we want to ensure that the resulting orbit about SEL1 is optimal for communication with the Earth. Once the spacecraft starts travelling on the trajectory towards SEL1, another difficult task must be accomplished by the flight dynamics and flight control teams. This relates to the fact that, despite what you always hear, libration point orbits are, unfortunately, unstable and the smallest perturbation can cause the spacecraft either to fall back toward Earth or escape into the inner Solar System. 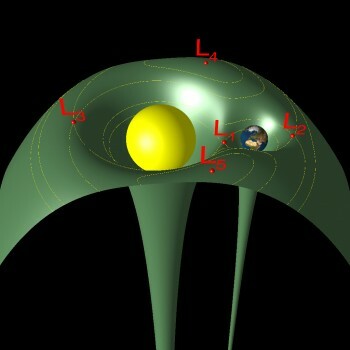 Thus, keeping LISA Pathfinder in its orbit about SEL1 is like balancing a pencil on its tip – except it’s actually much more complicated than this because we can only thrust in the Sun direction (due to the design of the spacecraft) and we have very little thrust available on the spacecraft (using just its cold-gas control thrusters) after the science module has discarded the propulsion module. So, we have to keep LISA Pathfinder in a very delicate balance: the craft must be kept in an orbit that is constantly ‘falling back’ toward Earth, with just very small puffs of gas to push it ‘back up’. Every week that LPF is at L1, we will have to give it a small push (these are the so-called ‘station-keeping manoeuvres’) so that it doesn’t actually fall back toward Earth. But the push must be small enough so that we don’t fall into the Sun direction either, because then the flight control team would have to conduct a rather complex manoeuvre, rotating the spacecraft so that thrust can be provided toward Earth to get the spacecraft back toward the ‘Earth-falling’ side — and this would make us lose valuable science time. Once en route to SEL1, a series of six thruster burns will ensure that we’ll end up in exactly the right trajectory – not falling toward the Sun and not too quickly falling back toward Earth either. This is post highlights just a few of the factors related to trajectory is only a small part of what makes LISA Pathfinder such a challenging – and fantastic! – mission for all teams working at ESOC. Initially, LPF is using ESA’s 15m tracking stations in Perth, Australia, Maspalomas, Spain, and Kourou, French Guiana. Once it is more than about 50 000 from Earth, it will use the three 35m deep-space tracking stations in Spain, Australia and Argentina. Read more about ESA’s Estrack network. LPF is operated from ESA’s European Space Operations Centre, Darmstadt, Germany, where not only are the Flight Control Team located, but also the extended functional teams of experts in areas like flight dynamics, mission analysis, ground stations and software systems. I have a quick question: If there are weekly station keeping burns, what happens to the test masses in this moment? Since their movement is obviously not influenced by the burn, they would collide with the spacecraft. Are they manipulated mechanically? With lasers? With low frequency electromagnetic forces? The thrust during the station-keeping manoeuvres is limited to a very small value such that the electrostatic forces are sufficient to accelerate the test masses accordingly. Nice article. Could you provide the currently planned orbit size after each ARM? So far I have noticed an increase from 200x1500km to 300x3401km, but I am not sure if this is after the first or second ARM. Naturally the real orbit will start to deviate from the planned sequence of intermediate orbits due to the limited manoeuvre execution accuracy. Florian – this is very helpful – maybe later you could provide the actual intermediate orbits used, for the historical record, once the final burn has happened? Also I’m a bit confused about which ARM number corresponds to which orbit in this list. Or to rephrase my questions: Are the test masses recaptured before the station keeping burns, and released again after? Or are they “pushed” with some other mechanism? Ahh ok I see, soory, you answer and my second comment were posted at the same time. But it seems that during the measurment there should be no electrostatic forces. I remember that in Gravity Probe B the biggest problem was some electroic charges in the test masses. But I think I have read somewhere that Lisa Pathfinder has UV lasers that can “decharge” the test masses with some kind of photo-electric effect, right? Prior to starting the weekly station-keeping manoeuvre, the control mode of the satellite is changed from the “drag-free” science mode (when little or no forces are applied to the test masses), to “accelerometer” mode, in which we suspend the test masses in their housings using electrostatic actuation. In this latter mode the test masses are forced to follow the spacecraft. There is no mechanical contact between the test masses and the spacecraft during the station-keeping manoeuvre. In Gravity Probe B, one of the issues was due to patches of charge on the test mass. Ideally, if you have a perfectly conducting body, then any charge should spread over the surface, creating an equipotential surface. However, in reality, surfaces are never perfect, and the alignment of the grains on the surface can create patches of charge which are different from surrounding areas with different grain structure/alignment. This was a problem in GP-B, as the test mass was a spinning sphere, in which it is impossible to null the effect. In LISA Pathfinder, we will also see surface charge patch effects, however, we have essentially a static cubic test mass, surrounded by a set of electrodes (two per face). We can measure the patch fields on the surface, and then apply a counter-field to the surrounding electrodes, thereby minimising the patch field effect. As for the UV “discharging”, this is a slightly different issue. Due to the fact that the conducting test masses have no-mechanical contact to the spacecraft, any deposition of charged particles on the test mass will lead to a differential electric charge between the test mass and the surrounding electrodes (i.e. the spacecraft). To reduce the differential charge to safe levels (<1e7 charges), we use the photo-electric effect, by shining UV light onto either the test mass surface or the electrode housing, depending on the sign of the charge differential. The light source is a mercury vapour lamp – the same technique (and same type of lamp) was also used in GP-B. Many thanks for the very detailed explanation! Thank you Florian for the Orbits. @Hendrik: LISA Pathfinder has UV light for de-charging the test-mass via photoelectron extraction, that is right. As far as I know the GP-B problems were due to patch potentials, which have been taken into account in LISA Pathfinder. They will also be measured and characterised in the Science Phase. GP-B problem was due to non-uniform coating, that generated electrostatic patches (potential difference, basically). This was enhanced by the very small TM-to-housing gap, that in Pathfinder is about 4 mm instead. If someone is interested in the ARMs, here is a spreadsheet based on simplified analysis (instantaneous delta-V changes). you can also include the final manoeuvre to about 1.5 Million km apogee altitude. The manoeuvre has a size of about 250 m/s, but the exact size depends on the phasing with the moon. Is the reason for the more or less circular orbit around L1 that this is “more” stable than being exactly at L1 or is there another reason? For some reason I’m getting 30 minutes for the 3rd ARM, but the blog post says 20 minutes? Maybe a typo? Could you state for the historic record when ARM #1 and the Test-Burn happened? Good Luck for the 5th ARM. Having a satellite directly at L1 is a bad idea, as the antennas on Earth would need to point directly into the Sun for communication. The Sun is a very loud electro-magnetic noise source. Therefore one defines a “Solar Exclusion Zone” around L1, which satellites usually avoid. The smaller the orbit around L1, the fewer propulsion required to stay there. However, there might be also constrains on the orbit size due to visbility from Earth and so on.